Empty-handed against a stick... this volume presents everything you need to know to defend yourself and prevail against one of the world’s oldest and frequently used assault weapons. Learn the drills unique to Russian Systema fighting and prepare yourself for any stick contact, in any position, while in-place or on-the-move, against single or multiple opponents. Enjoy this spontaneous and effortless work demonstrated at both slow instructional speeds, as well as real time speeds. You will be amazed at the simple and effective ways of defeating any vicious stick attack with your bare hands! This video is wonderful and amazing. It was more then I was expecting when I decided to ordered this video. You will learn how to deal with a stick attack when on the ground either face first or back first lying down supine. You will learn about how to make you body soft and yet be able to absorb the strikes wither thrust or swing. You will also learn how to deal with a stick swing to your legs. You will learn how to deal with a stick attack while your back is against the wall. You will have a whole heap of excises and games and drills to improve you skill sets. There are several inclusions to this latest DVD that stand out. The first inclusion, which is reminiscent of the old TRS tapes, is the student demonstrations. Watching Stickwork you can see many different students moving with varying levels of skill, from good to excellent. This is an important aid for students who primarily train by DVD and can only occasionally find a qualified teacher because it allows you to see how different people express the lessons individually. Every person on the DVD is moving uniquely to his or her own body, showing how practitioners of all shapes and sizes move correctly. This in an invaluable learning tool. The varying skill levels give the viewer the opportunity to see his own progression of movement as he improves in skill level. This is in contrast to simply watching Vladimir’s virtuoso performance and thinking to yourself how do I get to be that skilled. This DVD shows that path by including footage of students at various stages of growth going through the lessons. Connected to this student footage are the few short sections on the DVD where Vladimir has a student demonstrate and corrects him on screen. To the discerning viewer these tidbits are priceless because, once again, you can see not-completely-correct work followed by correct work within seconds of Vladimir’s guidance. Many people may pass these sections by to see the drills, but paying attention to these brief lessons gives insight as to why Systema works. I am happy they weren’t edited out. For all the auditory learners out there the explanations on this DVD are like a Systema strike--precise and right to the heart of the matter. You could actually take the audio and put it on your mp3 player and just by listening improve your Systema. The audio gives crucial keys to accelerate your training along with exact breakdowns of the purpose behind the drills while warning of pitfalls to watch out for. Watch this DVD a second time and focus on listening; using your ears with definitely open your eyes. The work shown on Stickwork is the brilliance of simplicity and builds upon exercises every Systema student already performs regularly. How to start work with a stick? Well, Vladimir shows a most logical progression. He takes the basic exercises--push-ups, squats, leg raises and sit-ups—and shows how they can be performed statically, in motion and in combination all while two other people poke and strike you with the stick. What struck me is how much sense the teaching progression made and how it links to everything shown in other DVD’s. Henry Wadsworth Longfellow’s observation, “In character, in manner, in style, in all things, the supreme excellence is simplicity,” applies perfectly to this DVD. In many ways Russian Stick Combat Vol.1: Defense is just the next in growing body of recordings of the masterful teachings of Vladimir Vasiliev. Russian Stick Combat Vol.1: Defense delivers on the “How the heck did he do that?” factor along with clear and concise explanation on how to develop this same skill. People often ask, “if there are no techniques or kata then how do you learn Systema”? One direct answer is to watch Russian Stick Combat Vol.1: Defense. This is the highest praise I can give to this energizing and informative DVD. I recommend you get it and start watching it with at least 2 friends. I guarantee that by the time you get half-way through it you won’t be able to resist the overwhelming urge to get up right there and start training. If you have a problem grasping mobility, flexibility, fullness, relaxation and tension this DVD is essential to your library. One word that is entirely over-used in marketing today is unique--particularly when describing martial arts DVD's. To paraphrase Bruce Lee, how unique can one art truly be over another when we ultimately have 2 arms, 2 legs and only so many ways to use them? Well, that type of logic normally operates as a running referential for me until I see a DVD like this one. Non-practitioners often say that our art looks a bit like Jujitsu, a bit like Aikido, a bit like Tai Chi and so on. Naturally, all body movement will resemble one another. What I try to convey that's it's not so much our principles or techniques but rather our way of training that defines our distinction. This concept has never been more fully and beautifully illustrated than it is in the newest Stick Defense DVD. Vladimir's work is incredible as always--beyond words. Added to this, the DVD contains a healthy assortment of student work, displaying different interpretations of the same core concepts which as a teacher, I massively appreciate. These components alone would make the DVD a huge value to any library but what really sets this production apart is the sequence of drills and exercises to help build an individual's skills. These concepts and exercises are so uniquely "systemic" and yet so efficient and so obvious that I wonder how in 25 years of martial study, I never encountered anything like this. Stick has always remained a large component of my training simply because it offers a hyper-accelerated learning curve. Once you can deal with the greater length and speed of a stick, the same mechanics and clarity overflow with relevance into your empty-handed work and all other aspects of your training. I could not give this DVD a higher recommendation. Beautiful work Vladimir and crew. Thank you for making this knowledge so generously available. This DVD is a distillation of all the stick exercises Vlad has taught us through several years of training. Of particular interest to me was the concept of the "full body" in different positions, the concept of minimal movement when being touched by the stick, and the concept of controlling your partner's speed through your own movements. Each exercise Vlad shows is a function within a larger equation. The sum of the parts allows the practitioner to to move versus, avoid, and eventually disarm the stick with relative ease. The 2 step and 3 step sequence at the end of the DVD is a great way for instructors to get students to start putting all these concepts together. I rate this DVD high on my list of must-have DVD's simply because the stick is a very common weapon (probably the oldest weapon known to humanity) and nobody puts together defense against the stick as well as Vlad does! Vladimir displays the flexibility and variety of defensive and offensive combat fighting techniques that a stick can offer. This DVD offers a thorough review of the basic principles of stick fighting and then progresses into more advanced techniques, which can easily be transferred to other potential unique weapons, such as a walking cane, baseball bat, etc. A simple stick in the hands of Vladimir easily becomes a terrifying and effective defensive and offensive weapon. After this DVD I look at the stick with different eyes! Brilliant!!! That is the first thing that came to my mind as I was watching this DVD. The progression and demonstrations along with perfect explanations are amazing! I have never seen anything so exceptional from any other martial art on the subject of stick fighting, and I've seen them all, from Irish to Burmese stick fighting with everything in between. Nor have I ever seen a DVD by Vladimir of this caliber. He demonstrates his true genius in this master piece. On a side note, watching Vladimir’s favorite stick being broken on Brandon’s hip, that's right his hip not the wall, made me laugh out loud! Way to go guys! 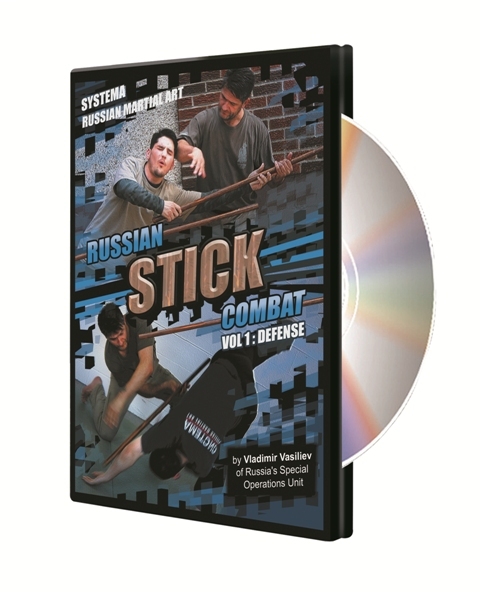 I have been offered the truly landmark new release "Russian Stick Combat" DVD for preview. People have been clamoring for coverage of Russian Stick work for many years, and now finally our ship has come in! That list may seem exhaustive, but in fact that list does NOT "say it all" because while that shows the stick work coverage, it gives little hint of how deep the presentation really is. There are innumerable meta-themes radiating from beneath the surface. In particular, I was struck by 2 such meta-themes that resonate through the whole art but are emphasized and focused by stick work. One was "filling the body". This is something everybody always wonders and asks about. Even long time students often wonder HOW can we train for a "full body". Sometimes people ask more narrowly only about "full arms" or "heavy hands", but this presentation makes it clear that an arm focus is too parochial; we are really trying to "fill" the entire body. People, this DVD is finally the last greatest word on this topic. In Russian Stick Combat, Vladimir offers a whole segment, and related material across many other segments, all the details of exactly how to work on "filling" the body. 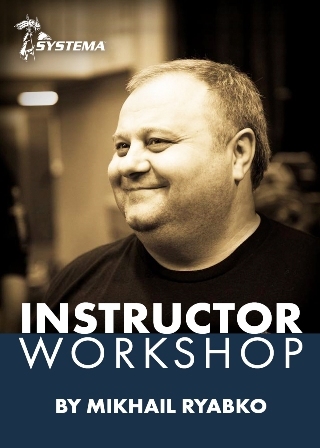 This is an essential mega-step forward in Systema training materials. It's obvious that the stick is the secret tool that hugely expedites this development. Another hidden gem, like so much of the Systema training catalog, the stated topic is a keyhole opening through which the entire panorama of Systema becomes sharply visible. The other meta-theme that especially struck me was the core idea we often have heard of "working against the opponent rather than the weapon". Again the equivalent of more than an entire segment is devoted to examining and illustrating this idea from every possible angle. Others more expert than myself would be able to say definitively, but in my view this idea could be the foundation for all weapons disarming and survival work. And in my opinion, the bedrock fundamental ideas of "working against the man not the weapon" are better presented here than I have ever seen anywhere. The sub-themes I have singled out above are just examples of the many deeper parts of Systema that are covered in this DVD. The foundational work of breathing, relaxation, movement and form are the constant threads, with absolutely superb in-depth emphasis in every single frame. It's another amazing example of how every Systema presentation operates on two levels at once; the particular application or immediate situation, and the deeper principles that are evident and explicit always. Another key point, for me personally, was that while other stick fighting materials that I have collected tend to emphasize the stick per se, and be limited and specialized to a particular single type of specialized implement, it is radically obvious that the stick fighting principles of Systema are completely general across any kind of impact weapon. I felt that mastering the material here would enable me to survive and prevail in any kind of impact weapon assault, such as club, bat, pool cue, metal pipe, 2 by 4, etc. As I have witnessed such attacks on several occasions, I have a lively personal interest in such generalized skills. And naturally the "master at work" jaw-dropping inspirational value of this DVD is beyond compare... actually I always say that about all Vladimir’s tapes. He's embarrassing me by constantly emitting these works of serious kinetic genius, leaving me speechless, having uttered every possible praise. In the martial arts world, there has always been a fascination with the ancient weapons, and so I am sure there is going to be a lot of interest in Vladimir’s latest release – Russian Stick Combat. This film has much to offer. More to the point, it works on many different levels. For those seeking defence tactics, rest assured there is plenty of counter work, takedowns and disarming to be seen. Vladimir’s consistent fluidity and timely movement skills are conveyed once again. But what’s also good to see in this film, is that his students also get to demonstrate their Systema skills. This allows the viewer to see how people of different builds and different attributes apply the art’s principles in motion. The students reveal good off-balancing skills and fast paced footwork; as they demonstrate empty hand counters to various stick attacks. The attacks take place in various environments; both in and outside. This allows the viewer to see how the environment affects the confrontation. Now the advantage in learning how to counter or survive stick attacks is that this type of training also helps to prepare people for dealing with a wide range of modern street weapons. Also, stick attacks are not as rare as some might think. After all, there are so many every day ‘stick like’ tools or objects that people can carry in their cars. These items could be some type of sports equipment, such as a hockey stick or base ball bat. Other mid range weapons that have similar applications are the crowbar and various farming implements. These street adapted weapons can be launched through the air at the similar angles to a stick attack. In the film, Vladimir does address the ways different weapons can affect the psyche of the targeted person. Actually, listen to the subtle insights that he conveys throughout Russian Stick Combat - there are some training tips being shared to the vigilant. Many of Vladimir’s productions contain profound clues to progression and this one is no exception. But again, I should stress that there is more going on in this DVD – beyond the weapons defence tactics. Have you noticed today how more and more martial art DVDs focus on the conditioning aspects of training? Well Russian Stick Combat is also a gateway into Russian conditioning drills. And this is going to make the DVD especially interesting to non Systema practitioners eager to add some diversity to their training. There are exercises in this film that can help to enhance floor based agility (a quality often needed in ground survival or grappling). There are exercises that show the practitioner how to overcome or work around their limitations in movement. On top of this are the drills which allow the practitioner to familiarize themselves with impact work and awkward blows ( blows that target the body from unusual angles). The exercises on display also show how the stick can be used to discover tension in the body and subsequent restrictions of movement. In other words, the stick can be used to develop a better understanding of strengths and weaknesses. Now it’s fair to say that in Russian Stick Combat, even the drills which relate to counter work offer some conditioning benefits. They also help people to understand the unusual yet very believable scenarios that could occur and have occurred. For example, one drill has practitioner working from the floor against a standing attacker who uses the stick to prod and jab at the defending practitioner. And in one of the demonstrations, a student has to defend against the stick attack, while recovering from another opponent’s rear push attack. This type of work is a good exercise in working under pressure. It is just one of the many ways that Systema helps people overcome street based mayhem. These are just a few observation about Russian Stick Combat volume one. Now in Hollywood, a film trilogy will usually involve epic scenes, incredible special effects and a plenty of action. Vladimir’s informative film contains no effects and no sweeping landscapes but it does contain ingenious drills and many useful insights. And like all good starts to a trilogy, there is plenty of action to get things rolling. Oh and one more thing… rumour has it, volume 3 will contain tactics with a field shovel!